Screening of sickle cell disease in newborn babies in mainland France from 2005 to 2013; the values are per region and in percent of the total number born that year. As this genetic illness is mostly confined to non-Europeans, primarily Africans, the ethnic origin of newborns can be derived from the data (see below for sources; map composed by FDesouche). Geographically one finds France in Europe, but demographically the country is swiftly drifting towards Africa as recent data indicates. France, unlike America, does not hold censuses on ethnicity, but follows instead its ideal of the color-blind republic. This, obviously, does not change one bit the ethnic reality on the ground, but it certainly helps to keep its citizens in the dark about it. 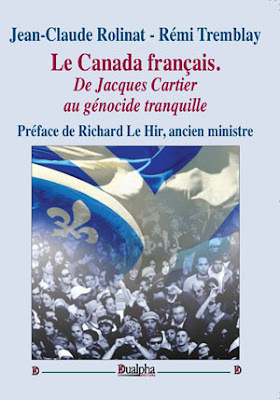 Little in the way of official figures exists on the size of the immigrant population and the native French — until now. Pertinent material has come from quite an unexpected source, medicine, and it has all the hallmarks of allowing us an adequately precise and unbiased look into the strong growth of the non-White population in France. Since 2000, the country has conducted a nationwide program of neonatal screening for sickle cell disease (SCD). SCD is a genetic disease by and large peculiar to non-European people. However, due to Third World immigration it has become the most common genetic disorder in today's France. To provide early medical treatment for the illness, the French public health authorities have defined risk groups which are liable to screening. These comprise primarily people of African origin, from North and sub-Saharan Africa as well as ethnic Africans from the Americas. A second risk group consists of persons with a Near or Middle Eastern background (Turkey, the Arabian peninsula and the Arab lands in between) and from the Indian subcontinent. The rest is made up of migrants from a comparatively small coastal rim in Southern Europe, namely Portugal, Southern Italy, Greece and the isles of Corsica and Sicily. In 2000, 19 percent of all newborn babies in mainland France had at least one parent originating from the regions above. This share rose to 28.45 percent in 2007, to 31.5 percent in 2010, to 34.44 percent in 2012, and to 35.7 percent in 2013. This percentage corresponds to 279,903 out of the 783,964 babies born last year. In other words: within thirteen years, the number of (partly) extra-European babies has risen on mainland from about one fifth to more than one third. The medical survey provides us with even more data, namely a breakdown per region (see map above). We learn that in 2013, 67.9 percent of newborns in the Ile de France, essentially Paris, descended from non-Europeans. In Provence-Alpes-Côte d'Azur, where Le Pen's Front National is particularly strong, the non-White share was 44.27 percent; in neighbouring Languedoc-Roussillon 40.04 percent. The lowest share was recorded in the Bretagne, 7.33 percent. 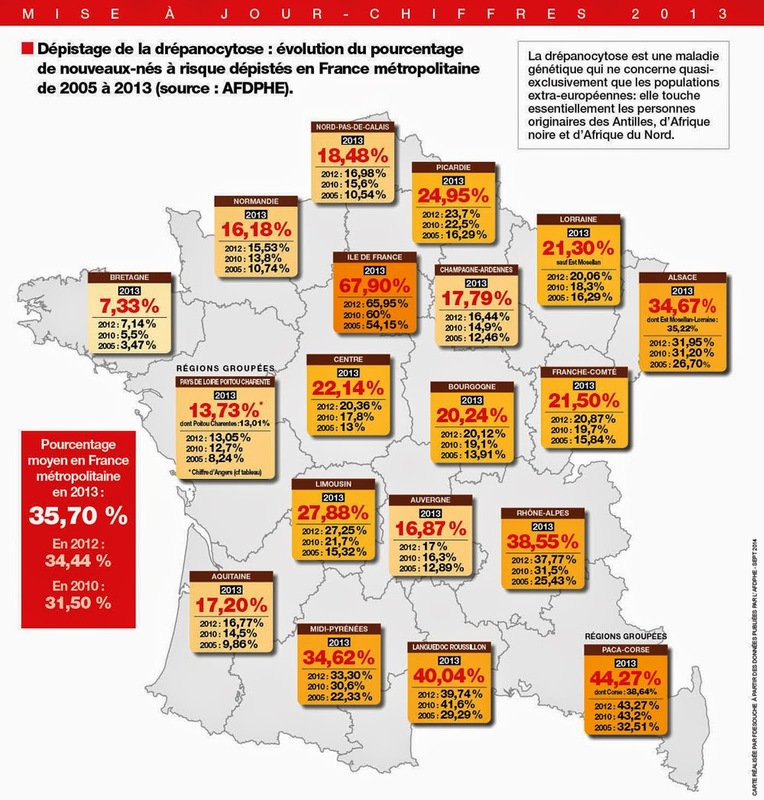 In every single of the 22 Metropolitan regions of France the portion of immigrant babies rose between 2005 and 2013. What can be said against the accuracy of these figures? Not much actually, they seem to hold water to all appearances. While the authors of the study point out that the screening of newborn babies is not applied universally, they regard missed cases to be "relatively infrequent". These would, in any case, not reduce, but increase the share of non-White babies among the total population. This leaves the Southern European immigrants, who are not independently accounted for in the statistics, as the dark horse in the equation. How high is their share in the studied risk group? Do we have to significantly adjust the number of non-white babies downwards to accommodate their share in the risk group? I would argue by far not enough to blur the trend: although descendants from Italian people reportedly number into the millions in France, most of them have immigrated generations ago. The screening, however, was employed in my understanding only for babies whose father and/or mother had immigrated from one of the risk zones, thus covering recent immigration only. as a result of population growth in African-Caribbean regions of overseas France, and now immigration essentially from North and sub-Saharan Africa to mainland France. Now my concern here is not with the spread of sickle cell disease as such, but with the sharp demographic decline of white France which these figures reflect and the impossibility to be allowed to talk about it in Europe's current multiculturalist climate. Being a political scientist by profession I look with envy on how freely these medical scientists, biochemists and geneticists, not burdened by the expediencies of political correctness and apparently completely unaware of the huge demographic implications of their findings, can go on discussing to what presumably amounts to the profoundest demographic change of France since the Frankish conquest and the creation of the French state itself. It's stunning: One only needs to substitute their discussion of the "screened babies" with "African-Oriental newborns", take a look at the SCD target population map of France they provide, and get a fairly complete picture of what enlightened France has been persistently denying to communicate to its people: that white France, the original France, the France which made France, is being phased out, making place for a hybrid Eurafrican society. Mass immigration has evidently become a self-defeat for La Grande Nation. One could argue that even for the immigrants themselves it produces diminishing returns: the more white France disappears, the less the country retains its character which had attracted all these immigrants in the first place. When I said fairly complete, this was not entirely correct. In fact, the demographic situation of white France is even worse for two reasons: first, the discussion has not touched so far its overseas departments which have always been home to an ethnically diverse population. Four-fifths of their newborns, the medical survey tells us, were subjected to SCD testing in 2013. By including this number, 36,844 babies, the share of non-White births increases from 35.7 percent for mainland France to 38.18 percent in all of France (316,747 out of 829,570 newborns). Second, the screening figures do not cover all those extra-European immigrant groups to the mainland which do not have a genetic disposition to SCD, like East Asians and Hispanics. Adding their birthrates further reduces the white French share of the total by an unknown margin. The bitter irony is that these population figures suggest that France has been more radically changed by its former colonies than it ever changed the face of them. Unlike its maritime rival Great Britain, France was never a successful colonizer. Its only permanent settler colony of note is Québec to which it sent no more than 10,000 settlers. If there is a "revenge of the colonies", as the White guilt trip of Western leftist thought has it, then France certainly gets more than its share back. France, like America, has always prided herself as champion of modern, "culture-neutral" Republican values to the whole world. Her historical achievement in spreading enlightenment around the globe is undeniable. But her lighthouse role has blinded her for the negative effects at home: it never fully realized that the total propagation of these ideals also gave rise to a culturally and ethnically gutted citoyen, someone dispossessed from his own roots and denied the right to have them. It never quite understood that a strong sense of cultural and ethnic identity is not the enemy of democratic values, but rather its necessary and natural complement. It forgot that the French Revolution, its gift to the democratic world, was not created in an ethnic and cultural vacuum but by people with an identity and history — a white European identity. It may therefore be no coincidence that France, again like America, is among the first Western countries to fell demographic victim to its own negation of culture and ethnicity. In a way, history has come full circle: what France originally exported as an idea, the radically culture-blind republic, leaves her now helpless to come to grips with its own rapid de-Europeanization – the revolution devours its children, for good. 1. Léchenet & Laurent acknowledge that the French authorities conduct these tests for parents from the above risk regions which lie overwhelmingly outside Europe (mainly in Africa, but also the Middle East and territories with a substantial black populace like the Antilles and South America). Yet, they like to make the point that the disease is due to "geographic, not ethnic factors". But this is merely a different label for the same phenomenon. Whether we call this risk group as coming from the continent of Africa or being of ethnic African origin is semantics, nothing more. The point is they are not from Europe, they are non-European immigrants. 2. Léchenet & Laurent argue that SCD is a "globalised" disease, but this is just another angle that aims to blur the ethnic character of SCD. Yes, SCD has been — mainly in the Western hemisphere — globalised, but the point is through the migration of African people. It is prevalent where people with African origin have settled; it affects people with African DNA. This means that by looking at the results of the screening program, nationwide applied as it is in France, we can determine their share of newborns in French hospitals reliably. 3. Léchenet & Laurent claim that the figures of non-white births in France widely circulating on patriotic websites include the ethnically diverse overseas departments (DOM) and thus have to be lowered considerably. But this is not true. The French agency in charge, the Association Française pour le Dépistage et la Prévention des Handicaps de l'Enfant (AFDPHE), has been listing for years the SCD screening figures separately for mainland France and the DOM, as well as their aggregate. It is invariably the figure for mainland France only which is cited prominently on these sites, giving rise to fears among ethnic French people about being replaced by foreigners. As of 2013, this figure is 35.7 percent for mainland France and 38.18 percent for all of France, and it has been rising sharply ever since the time of the inception of the screening program. 4. Léchenet & Laurent go on citing data from the national statistical institute INSEE, according to which only around 20 percent of the births in France are to "non-French". However, they are comparing apples with oranges. INSEE does not gather data based on ethnicity, but exclusively on the criteria of citizenship. These 20 percent refer only to babies born on French soil with one or two parents who do not hold a French passport. This figure tells us nothing about the real ethnic ratio in French delivery wards because the French Republic traditionally observes the ius soli which millions of Maghrebians and other non-European immigrants born in the country have enjoyed in recent decades. Léchenet & Laurent might object that this is all the French need to know. But an increasing number of French people do want to know about the population distribution by race and not just by law. INSEE does not provide this kind of information, but AFDPHE does, if only unwittingly so. 5. Léchenet & Laurent further cite an estimate by the Institut national d'études démographiques (INED) which holds that currently about one fourth of the French people have a migrational background in the sense of having at least one grand-parent from abroad. They list a number of "immigration waves" by various European peoples to France and conclude that, in the light of this figure, speaking of an "autochthonous population" makes little sense. Again, they miss the point. The rising popularity of the French websites they castigate and the increasingly widespread concern about a "Grand Remplacement" amply demonstrate that French people do not easily equate current African-Oriental with past or present European immigration. The French evidently do not worry about being overwhelmed by people going by the slightly foreign names of Jean-Paul Belmondo, Lino Ventura or Louis de Funès. But they do seem to be worried about the impact of immigrants from beyond European civilization like Mohammed Merah, Mehdi Nemmouche and Dieudonné M'bala M'bala. The question is will the mainstream media address these concerns as they are or will it forever continue to shift the subject by miscategorizing ethnic French interests in terms of vacuous passport possession statistics. 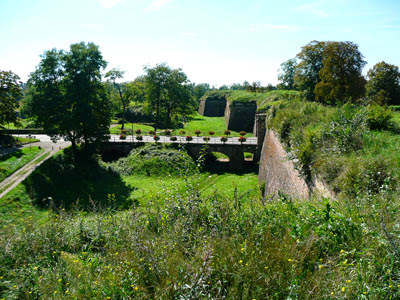 The overgrown walls of Vauban's Neu-Breisach border fortress symbolize the declining will of France to assert herself. Today, the French state has become the main threat to the French people, sponsoring non-European mass immigration and naturalization and battling dissenting indigenous voices. Jews have a monopoly over the media and Jews are the ones who have orchestrated this genocide. Thus, the Jew media is not "missing the bus", they are quite deliberate in their efforts to conceal the facts. Meanwhile, Jewish lawmakers have made it illegal ("hate speech") to even speak of their sinister agenda against us.